An email exchange involving employees with the tech firm that managed Hillary Clinton’s off-the-books email server provides new insight into the company’s deliberations in the early days of the FBI’s investigation of the former secretary of state. The email chain, which was obtained by The Daily Caller, shows that an employee for Platte River Networks joked about accessing the email accounts of employees of the Clinton Executive Services Corp., a pass-through company owned by the Clintons. 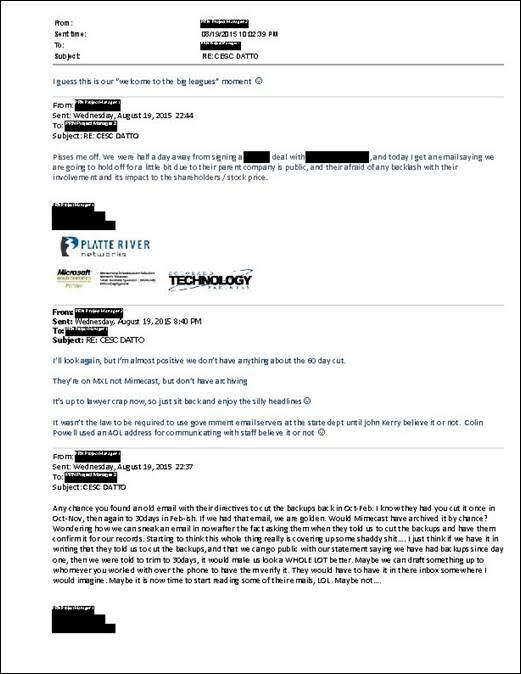 The emails, which are dated Aug. 19, 2015, also show that PRN had a would-be corporate client back out of a deal at the last minute because of its involvement in the Clinton email fiasco. PRN provided the email chain to the Senate Homeland Security Committee last year. TheDC obtained a copy from an aide with the House Oversight Committee, which held a hearing on Tuesday in which two PRN employees pleaded the Fifth. One of those employees was Paul Combetta. A PRN network engineer, Combetta received immunity from the Justice Department in order to cooperate with the FBI’s investigation. He also appears to have lied to investigators about the timing of his decision to use a software program called BleachBit to delete backup copies of Clinton’s emails in March 2015, when they were under subpoena. Combetta was asked on Tuesday during the Oversight hearing whether he was involved in the email chain. The names of the sender and recipient of the emails are redacted, a decision seemingly made by PRN. Combetta refused to answer Chaffetz’s questions and invoked the Fifth. PRN was first identified as being involved in the email quagmire last August, just after the FBI opened its investigation into the possible mishandling of classified information on Clinton’s server. The employee wanted to show that PRN was acting on orders from the Clinton firm to configure the server to automatically delete records older than 30 days. “If we had that email, we are golden,” the sender wrote. Wondering how we can sneak an email in now after the fact asking them when they told us to cut the backups and have them confirm it for our records. I just think if we have it in writing that they told us to cut the backups, and that we can go public with our statement saying we have had the backups since day one, then we were told to trim to 30 days, it would make us look a WHOLE LOT better. Maybe we can draft something up to whomever you worked with over the phone to have them verify it. It is unclear how, or if, PRN had access to Clinton Executive Services Corp. emails in addition to Hillary Clinton’s. The PRN employee who responded said they would look back through their records for correspondence with Clinton Executive Services, which the Clintons use as a shell company. They then offered commentary about the coverage of the email scandal up to that point. The scrutiny provided by the scandal appears to have hurt PRN’s business. “Pisses me off,” the employee responded. “We were half a day away from signing a [redacted] deal with [redacted], and today I get an email saying we are going to hold off for a little bit due to their parent company is public, and their [sic] afraid of any backlash with their involvement and its impact to the shareholders/stock price,” the email reads. “I guess this our ‘welcome to the big leagues’ moment,” reads the reply. Other emails released separately on Monday provide insight into PRN’s decision-making timeline regarding the email probe. Those records, which were released by the House Science, Space and Technology Committee, show that PRN initially planned to cooperate with congressional requests for documents pertaining to Clinton’s server but then reversed that decision days later. But days later, PRN’s lawyer informed Datto’s attorney that his client would not be complying with the Senate Committee’s request. PRN’s decision to stop cooperating with anyone but Clinton has raised questions about whether the firm has sought to protect the candidate. If Clinton did pay the bill — a possibility which has not been confirmed — PRN and Combetta would have effectively been working for her during the interview with investigators. Combetta’s decision to delete backups of Clinton’s emails last year has also raised questions about PRN’s relationship with Clinton. The tech worker made the deletions on March 31, 2015, days after speaking with members of Bill Clinton’s staff and just before holding a conference call with Hillary Clinton’s lawyers. 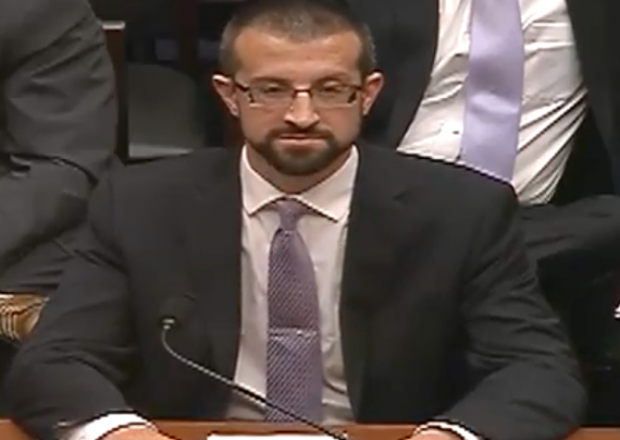 When asked by the FBI about his conversation’s with Clinton’s attorneys, Combetta’s lawyer advised him not to answer the question and cited attorney-client privilege. An FBI report released earlier this year showed the Combetta gave conflicting answers in interviews in February and May about why he made the decision to delete backups of Clinton’s emails. Combetta has not responded to email and voice mail requests for comment.